Ludwig is an item link database addon that was originally based on GetLink. Ludwig is not dependent on saved variables, and Ludwig does not require the user to do anything special in order to collect data. Search Window - You can filter via name, quality, level, type, subtype, and equip location. Linkerator support - Typing an item name in [[brackets] will automatically convert the name into an item link if the item is known to Ludwig. Command line searching - typing /lw <name> will bring up a list of the top 10 matches in the chat window. * Updated database for patch 5.2: The Thunder King! * Updated database to patch 5.1: Landfall. * Jaliborc: No more "Jaliborc:" tag from now on. If no tag is here, it means it was me. * Jaliborc: Only works on English clients. Versions for other clients should be released in a close future. * Fixed a bug when linking an item from the chat frame. * Altered slash commands. See addon description for details. * Bumped the max item ID to check from 40k to 60k. Glyphs, etc, should now appear. * Seems to be causing a lot more CPU usage now, will investigate later.tigate later.te later..
Do you support item versions? 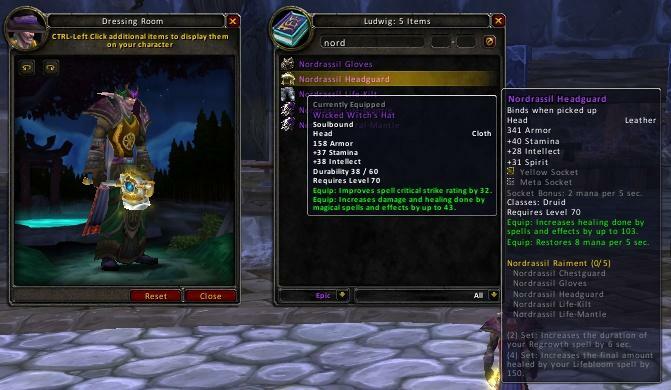 Say, WoD+ raid loot, WoD's crafted item upgrades etc.? Will this be updated for WOD? is there a way to move the frame? Change the x and y values to your liking. Note this procedure is tested for Ludwig 5.4.2 and may or may not work with other versions. Edit1: That line would probably have to be added to some other function as well, to prevent the frame from reverting back to its inherent default position e.g. when another frame like the character frame gets opened/closed. Feel free to dabble - there's not much you can do wrong with it anyway. Last edited by harl : 07-05-14 at 04:42 AM. I'll see if I can skin the addon myself, but does it appear skinned for you guys? However, I put the Ludwig skinner file in the skinme folder and it still won't skin ingame. Any ideas? Talk to skinner author, we cannot do anything about it. My gut says that something funky happened in the merging process (I've still yet to test out stuff to confirm). Possible to have Ludwig parse through text sent out by macros? Would be a welcome addition to WTB/WTS macros. In testing here, all of v2.0.0 (Beta) & the latest Github Ludwig_Window builds c12ea5bdab4548c20ff7 & 1eb948f1eeff8ff243ae bug out when opening the LOD frame (via /lw). The earlier Ludwig_Window build 86bf00ae438ef9f24839 has no issues. WoW 4.1 live, USEnglish server. Type in /lw with either of the first three versions above and the following errors are thrown up. As well, nothing shows up in the Ludwig frame but it shows the full item number in the title bar (i.e. "46300 Items"). I checked the three Ludwig_Window TOCs; there doesn't seem to be any unexpected whitespace in them. There are differing line ending types on some lines, but there is as well on the earlier working build.